1. Log-in to your Facebook Profile. 2. Go to the upper right hand of your profile and click “Update info“. You can also go directly beneath your profile picture and click “About“. This will open “About” page. 3. In “Work and Education” corner, click “Edit” which is located in the upper lefthand area. 4. If you have the existing employer info, please click “x” icon located beside the “Edit”. A pop-up question will ask you to confirm the deletion of the existing entry. 5. Now you’re going to re-add your employer’s Facebook Page not the Community Page. 6. 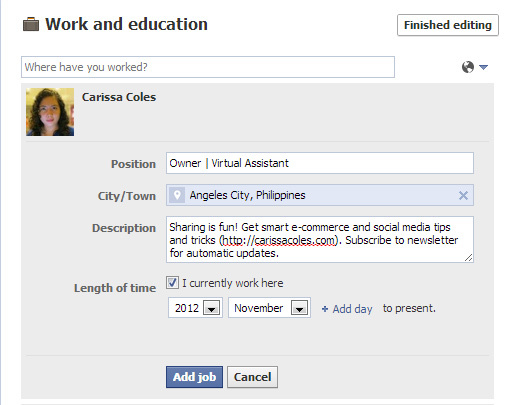 In the “Where have you worked?”, please type in the EXACT name of the Facebook Page you are going to link to. 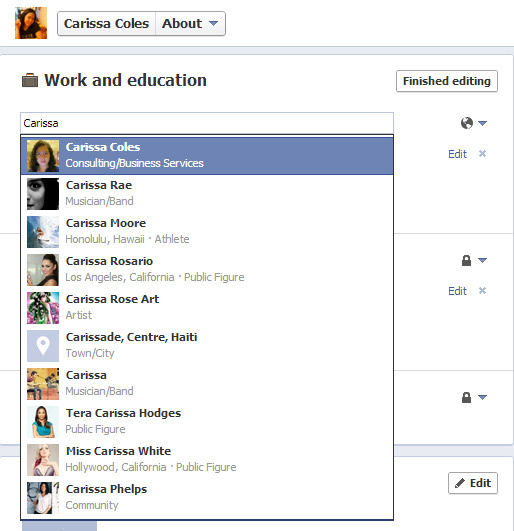 In my case, I am going to type “Carissa Coles” because that is my Facebook Page. Once you start typing, please choose the appropriate name of the Facebook Page. Surely, Facebook will show suggested pages. 7. When you have already added your Facebook Page, you will notice that the thumbnail image of the profile picture of the page along with a link to it in the “Employer” area. 8. There will also be an automatic fields you need to fill-in including Position, City/Town, Description, Length of time and year. When you are done, click “Add Job” and then “Finished Editing“. Here is the final result; you can now see the published “Work and education” info on my profile page. Easy huh, you can do it on your own. Try it and let me know how it works for you.